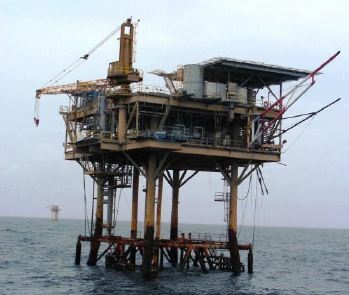 South Timbalier 196 B - Platform Removal - Global Diving & Salvage, Inc. Global provided surface diving support aboard the D/B Superior Performance during a drilling platform removal. The Global team was there to assist, as needed, with the removal of the topside package and platform jacket during decommissioning. Dive work was performed down to 105 fsw using standard surface diving procedures. The platform was initially cut free from the jacket, then the legs were cut 15 feet below mud line using explosives. After all the legs had been severed, the platform toppled onto its side so that the D/B Superior Performance could pick up the structure, approximately 710 metric tons, and set it on the materials barge for transport to shore and proper disposal.